The Allah-Las have emerged as one of my favorite bands this year (my review of their recent EP is here). There is a temptation to throw labels on bands, but I'll pass on playing this game for now, and just state that the way their music makes me feel is one of the principal reasons I listen to music. So I've chosen to make your summer Saturday morning better by giving you a little internet concert. Consider supporting the group and owning their music. Do you like parties? Oh good - so do I. And if you like parties, you may well like Endless Knocking by Edinburgh's Jesus H. Foxx. For me, Endless Knocking is like going to one of those wonderful house parties full of witty, eccentric characters. As you wander through the house, you find interesting conversations or happenings in every room. Everyone is nice and charming, but at times you may have to struggle a bit to get the joke. So too, this album is full of diverse, eccentric songs, characterized by mid-song changes of pace and style, and unusual rhythms. The result is a very satisfying collage and, like when you go home after a good party, you'll be satisfied, energized and having made a few new friends. The first single from the album is the charming "So Much Water", which features jangling guitars and dueling vocals (the track on this player ends thirty seconds early, and I don't know why). The song can be downloaded free at this link. 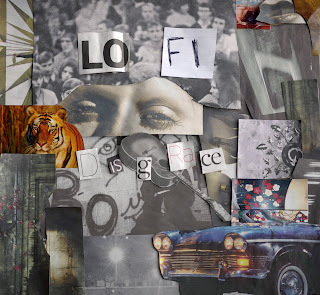 Jesus H. Fox was formed in 2007. They released a smaller recording in 2009, and built a devoted local fan base that was eager for an album. 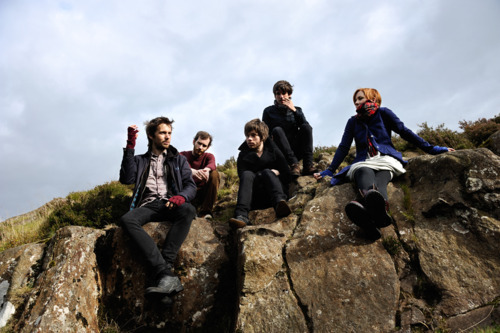 In May, the band delivered Endless Knocking via Edinburgh's Song By Toad Records. Apparently, the album had been recorded in 2010, but the band wasn't satisfied and reworked the songs until they felt comfortable releasing the album. The band's line up is Michael Hunter (vocals/guitars/keys), Neil Duncan (guitars/vocals/drums), Owen Curtis Williams (drums), Rich Butler (bass/vocals), Richie Henderson (guitar/vocals/keys), Tallah Brash (cornet/glockenspiel/keys/vocals), and Thomas Western (keys/vocals). Their facility with multiple instruments, and the fact that they all sing, give the band more flexibility in fleshing out the songs, and extending their sonic range. Coupled with the inventive songwriting (and, apparently, perfectionist approach), it is no surprise that this is a quality listen. The Soul Corner - Geater Davis "Sweet Woman's Love"
A loyal reader (thank you Mr. Graves wherever you are!) tipped us off to a soul artist we had not previously heard. Geater Davis is one of those hard luck stories - bankrupt record companies, never caught a break, etc. But he wrote some great songs and created some truly fine deep soul recordings. Here's "Sweet Woman's Love" from 1970. Geater Davis' work is highly regarded enough that there are a few compilation CD sets available, notably Sadder Shades of Blue: The Southern Soul Sessions 1971-76. We will certainly be picking that one up for the Soul Corner library. Davis was from Kountze, a small oil industry town in east Texas. He died of a heart attack in 1984 at the age of 38. As I understand it, Larry Reid and his fellow Cinematics had left their Glasgow homes to live and record a third album in Berlin. Instead, the band broke up and Larry was left in Berlin, working as a DJ, and without a band. He started writing material for an album, informed by the isolation and loneliness inherent in being far from home, without his band, and not speaking German. Apparently he considered scrapping the project at various points, but he eventually became persuaded that recording and releasing it was the right approach. Good decision, Larry. Good decision. Recorded and released under the name Laurence and the Slab Boys, Lo-Fi Disgrace is a noisy, fuzz and feeback-laden brand of dream pop, with a few hard edges musically and plenty of hard-edged emotions lyrically. For me, it is one of the brooding highlights of the year so far. There is no major label involved, so it is the album Larry and his collaborators wanted to make, made to please them and not some A&R guy's image of what would sell. Perhaps the best introduction for the reader is the second track, "Mushroom", which is the first single from the album. Here is a live version. 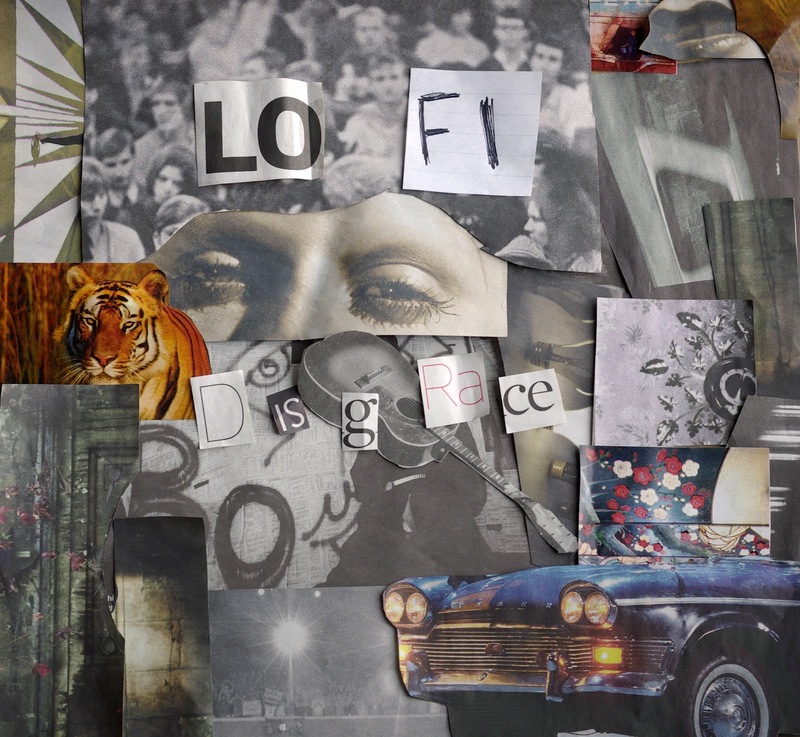 LoFi Disgrace includes tracks with upbeat melodies as well. In particular, "Space Dream #2" and the track provided below, "Ballroom Killers", could feature on the dance floor. And "K.E.O." is a swaggering delight. The album was recorded in Berlin and Manchester. The label is Grumpy Records. In addition to Reid, the band includes Josh Brady, Matt Smithson and Lee Walsh. The group takes its name from a trilogy of plays written by Scottish playwright John Byrne and set in Paisley, the town in which Reid was born. Cats On Fire has released a video of the band performing "After the Fact" from their spring 2012 release, All Blackshirts to Me (our review here). Since US readers don't have many opportunities to see the band live, this may be your closest look. If a gathering of jangle pop fans sat down, poured a few ales (yes, we drink ales, thank you very much), and took turns offering lineups of potential supergroups, one certainly would have a knock-out round contender if he or she suggested Bart Cummings (The Cat's Miaow, Hydroplane, Pencil Tin and The Shapiros), Mark Monnone (The Lucksmiths), Louis Richter (Mid State Orange, The Lucksmiths), and Jeremy Cole (The Zebras). But the truly competitive player (assume that the winner drinks free) leaves nothing to chance, and suggests that the vocals for the group be handled by Pam Berry (The Pines, The Shapiros, Glo Worm, Black Tambourine) and Scott Stevens (Summer Cats, The Earthmen). 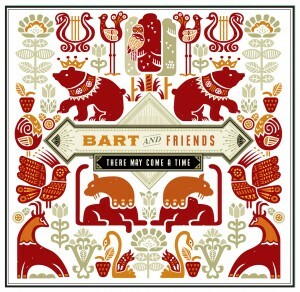 And we all are winners, because that's the current iteration of the Australian supergroup, Bart and Friends. Assembled around Bart Cummings, Bart and Friends' first iteration was around 2000, and released a few records on two different labels. A second gathering released an EP and a mini album on the Lost and Lonesome label late in the '00s. The 2012 version, with the membership proposed by our hypothetical winning jangle pop fan above, has recorded one of the EP gems of the year so far, There May Come A Time on Matinee Recordings. Shimmering, jangling guitars, bright melodies and affecting vocals, this is the motherlode for guitar pop fans. The only criticism one can have is that it is over very much too soon. I should mention that among the other tracks is an excellent jangly version of Elvis Presley's "Can't Help Falling In Love", two songs from a long sold out earlier Bart and Friends album and to other sweet tunes. If my computer could develop deeper grooves from excess plays, the section with this EP would look like the Grand Canyon. The June Brides were among the best, and best loved of the C86 bands from the UK from 1983 to 1986. To the delight of their old and new fans, the band's front man, Phil Wilson, has revived the group. Their first recording is a double A-side "A January Moon/Cloud", on Slumberland Records in the US and Occultation in the UK. You can sample both tracks below. In addition to Wilson (guitar/vocals), the current iteration includes original members Frank Sweeney (viola), John Hunter (trumpet), and Simon Beesley (guitar/vocals). Phil's recent projects under his own name have included Andy Fonda (drums) and Arash Torabi (bass/vocals), and I suspect they were involved on these recordings as well. 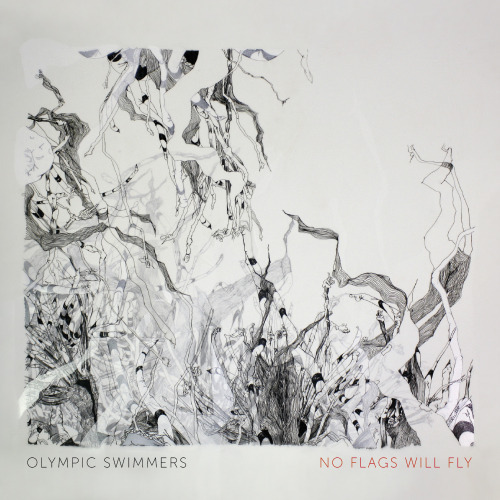 No Flags Will Fly, the debut full-length from Glasgow's Olympic Swimmers, is one of those albums. By that I mean if you first hear it a year or two from now you'll say to yourself "why didn't I know about this album, and why didn't I know about this band, in June 2012". Well, dear readers, it is our goal to save you the public embarrassment and private self-loathing that can result from such circumstances. Olympic Swimmers are Graeme Smillie, Jamie Savage, Jonny Scott, Simon Liddell and Susie Smille. 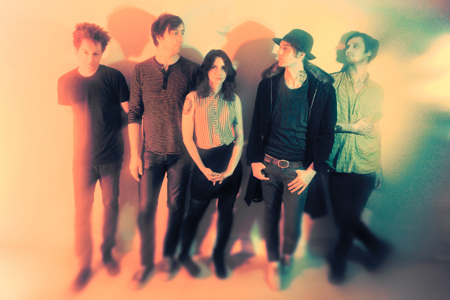 Their music is a melodic, sophisticated, multi-layered indie pop, featuring excellent musicianship and stellar vocals. They have released a couple of EPs, and aren't strangers to recent "ones to watch lists". No more teasing and no more promises from this gang, they have delivered. The music is diverse and uniformly outstanding. Some parts are delicate, some vulnerable, and some noisy and bursting with energy. While the entire ensemble is excellent, Susie Smillie's vocals may be the most memorable feature in this set of songs. Ethereal, folky or pop, as demanded by the musical context, but always with remarkable clarity and a hint of emotional ache. "Apples and Pears" is probably the nearest track on the album to pop song. "Where It Snows" is a perfect slice of dream pop. Apparently, some of the footage in the video was shot in years ago in the village in which siblings Susie and Simon grew up. No Flags Will Fly was available on June 4. The band isn't signed to a label, but you can purchase downloads at the Bandcamp link below, as well as iTunes and other download stores. Physical copies are available in some UK stores, but US fans probably would need to have them shipped. When a stunningly good album is released, one that you want to play over and over and tell your friends about, the temptation is to assume that it all came somewhat easily to the five young folks who can proudly call it their own. But in the case of London's ExLovers, there was a lot of hard work behind this dazzling debut. In their early days even the stereotypical broken-down tour van was a bridge too far -- Exlovers traveled to early gigs via public transportation (how many seats does one purchase for a drum kit, anyway?). But this review has nothing to do with sympathy or extra points for hard work; this review is earned by releasing a collection of songs that should demand the attention of any guitar pop fan. "Emily", which will be released as a single in July, is third, and is a wonderful piece of melancholy. If you are like me, at this point you are thinking that Exlovers has a great mastery of the guitar pop genre, and Moth will be a very creditable first album if they can bring it home without losing too much steam. As the remainder of the album unspools, the band demonstrates equal comfort with slower, sadder songs, but never loses their sense for melody. Moth is the work of Pete, Chris, Brooke, Laurel and Danny. Their guitars ring, jangle, chime and crunch as needed. The rhythm section is superb (one of my fellow WYMA contributors, on first hearing blowing kisses, said something like "man, what a drummer"). And the male/female vocals, alternating and harmonizing, contribute a texture that many other bands can only envy. When describing Moth to a friend, he asked me to compare it to the debut from The Pains of Being Pure at Heart because he knows that I'm very fond of that band. My response was that I think Exlovers paints on a broader indie canvass than TPOBPAH. But more than that, I think Moth quite simply is a better album than the Brooklyn noise poppers debut. It is that good. Moth is released on London's Young and Lost Club label. You may recall that the debut from Being There was released by the same label earlier in the month. Make a note of them--Sara and Nadia are tastemakers and curators of fine new music. I was asked to write a bio for Sarah Gwen, a new Portland singer-songwriter whom I have been closely following and cheering on for the past 2 years. So our readers at WYMA get the first glimpse of this strikingly talented new artist. While it is true at a certain level for all debut records that the artist went through a lifetime of experiences to create that work, Sarah Gwen’s story is more literal than many. Inspired by Nirvana then at their apex, Sarah taught herself to play guitar and start writing songs at 15, in the small Idaho town where she grew up. That push led Sarah Gwen to Portland’s Dead Aunt Thelma’s Recording Studio with Scott Weddle, multi-instrumentalist and engineer Mark Orton (Tin Hat Trio), and somewhat remarkably, two friends of Weddle’s and one of the most highly regarded rhythm sections in Americana music – drummer Jay Bellerose and bassist Jennifer Condos – on a brief hiatus from touring as Ray LaMontagne’s band (The Prairie Dogs) and various high placed sessions jobs (Robert Plant / Alison Krauss, Aimee Mann, Joe Henry, Paula Cole and a near endless list). The songs vary quite a bit in Americana flavor from country (“King of France”, “Good Girl”), Tom Waits-ish stompin' blues (“Come Get Me”, “Woods”), soul (“Don’t Mean To”, “Ready”), pop (“Be Mine”) to a couple terrific ballads (“I’ll Show You”; “Elephant”, in video above, an earlier live recording in a studio). Listen here to "Woods", "King of France", and "Be Mine". No one would guess that such a newcomer would possess the power, control and confidence shown in “Impossible” to repeat a simple line and just ever so slightly turn up the heat as she proceeds: “Are you jealous?” “Are you jealous?” Are you jeall-louss? Do you get jealous?” Sarah Gwen is a natural, blessed as both a writer and singer with a controlled intensity and authenticity that you can’t teach. The one song here that Sarah Gwen did not write is an unlikely cover – Genesis’ “Misunderstanding”, about as far from the tough Americana tone of this CD as one can get. There is zero irony in this slowed down, aching version of the song, which Sarah Gwen against all odds transforms into something genuinely moving. Preview and purchase right now at iTunes: Sarah Gwen . Hard copies of the actual CD are coming in September. Additional musicians and singers: Paul Brainard, Rob Burger, Dave Lipkind, Megan Orton, Warren Pash, and The Real Vocal String Quartet. A relatively recent favorite here at When You Motor Away is Nashville rock band PUJOL. Following up on last year's EP Nasty, Brutish and Short (WYMA link here), they've delivered a terrific debut album, United States of Being. But it's not all fuzz and pounding, there are a variety of sounds on this record. There's some riff-based, almost "album rock" sounding stuff in the middle - "Keeper of Atlantis" and "Made of Money" feature guitar riffs and piano lines that wouldn't have been out of place on, say Kiss or Skynyrd records. Then, an acoustic song, "Endless Mike", but eventually it's back to what I would call the signature sound (and the sound that makes me want to hear more from this band): "Reverse Vampire". The record is out now on Saddle Creek Records. PUJOL played Bonnaroo in Daniel's hometown of Tullahoma, Tennessee - so the buzz machine is probably already in high gear. And it's well-deserved. Check this out from Paste magazine. I hope Mr. Henry and Ms. Hannigan are still performing "Helpless" next week when they come south of the border to Portland.